much love, illy: GIVEAWAY: shop credit to Goose + Trisser!!! i've always been so fascinated by embroidery work - especially when it goes beyond grandma's favorite quotes (nothing wrong with that, of course). rachel's delicate and colorful handiwork pieces are some of my favorite kinds of embroidery work out there. the background patterns are whimsical and the colorful words are a sweet treat. see for yourself, friend! Tell us about YOU, the brains and artist behind your shop and blog. I'm a late 20-something wife to T, and mother of a one year old beauty, Bird, who gave me the inspiration for my first shop item that has just spiraled into Goose and Trisser. I foolishly moved back from Southern California after two fun years of great weather and good times, back to my forever home in Southeast Michigan. But I wouldn't have it any other way. I used to spend my days doing advertising, and now I spend them with my Bird, napping when she naps, playing when she plays and creating in the wee hours. Rounding out my days, I make time for my husband who loves my hair brained schemes and is unconditionally supportive, which is great cause I have a lot of those. Is there a story behind your shop's unique name? The name of my shop comes from my husband and I's nicknames for each other. I am known as the Brown Goose and he is just my Trisser. Lucky for me, we are the only pair out there and the name stuck! I love the unique designs of your products. I am inspired by so many talented people in my everyday life and those that I am continually happening upon on the interwebs. I pull from good memories that I have, things I want to give to my friends and family, and random things I think just might work. to in the new year? In the new year, I'm excited for my little family to grow, perhaps, for my shop to continue to be inspired by the beauty and community around me and to really enjoy all the moments I am given. I really don't have any one place that I would like to go or see. I always get stumped by this question. I've been to Italy and it was amazing and beautiful. I don't really have a want to go to Africa and see the "homeland" or anything. I want to go to London, but doesn't everyone. I really love Canada but its my neighbor to the North and I feel like I should pick a more far away place. So I guess my answer is a bit of every where, I have a wanderlust for all the world. so guess what today's sweet giveaway includes? you will LOVE what rachel is offering one lucky Much Love, illy reader! did you wipe that drool off your face, yet? use the coupon code MUCHLOVE for a 10% discount off of your entire order. code applies for the entire month of January. you have a week left so hurry! Giveaway closes at midnight, Sunday January 30th. The winner will be announced on Monday, January 31st. I'm a follower! And I like the "Eat Vocabulary Hoop! I'm of course a follower. I would buy her Sing Vocabulary Hoop! It's so adorable. And now I heart Rachel's shop! I like the "because I love you" stitched card. Of course I'm a follower of your fab blog. My fave item from her shop is that golden yellow belt. LOVE THAT! I follow @gooseandtrisser on twitter. Oh I can't decide on my favorite! I would love one of my home state of SC, but I also love the storm cloud and one of the monogrammed hankies... such a difficult choice! I follow goose and trisser on twitter too! My favorite in her shop is the Custom Family Crest ! I follow you! My fav item is the Listen vocabulary hoop. I am a follower and I love the Stormy Skies hoop. I am a sucker for blues and water themes though. I am a follower! And I love the eat hoop- it would look great in my kitchen! I totally agree with the other comments, i love the eat hoop. i already follow rachel's blog! AND i already heart her shop! and i also follow rachel. Definitely a follower! And I <3 the Home Vocabulary Hoop! Ohhhh I love the Sunny Sward one! So so cute! What a great share and so glad I stumbled upon your blog. Lovely pictures annnnd outfits, you're so cute! Can't wait to read more! of course i follow your blog! and i LOVE the Yes, Michigan - State Love four inch (4") hoop scene... for obvious reasons!! i follow goose and trisser on twitter!! Following the Goose + Trisser blog! I am a follower and I love the Listen Vocabulary Hoop!! I Hearted the Goose and Trisser Shop!! It really is a great shop! Plus!! I am now a follower of her blog! yay! I love embroidery :) The Sunny Sward is so cute, its my favorite. thanks for the great giveaway and for introducing me to good & trisser! p.p.s. i heart her shop! 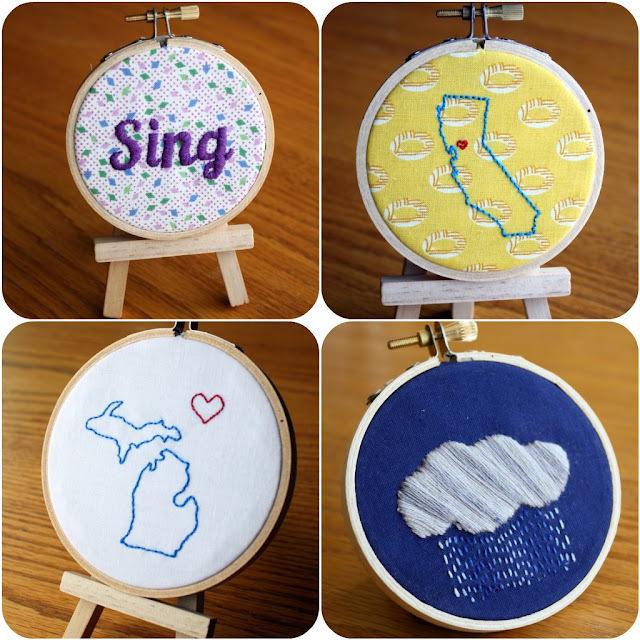 How cute is that "Sing" vocab hoop. Following! oh gosh... I think i left a comment but didn't follow the giveaway guidelines! I am a follower (of course!) and please hand over the Ruffle Puffle Immediately! And now I follow Goose + Trisser! I'm a follower of goose+trissers blog! follower of MLI & my fave is the sunny sward. so fun! I just discovered you through Kendi's giveaway! I love your poppies! I (now) follow goose+trisser's blog. The "eat" hoop! So cute! I'm a follower and I love the Sing hoop! I'm a follower! I also love the state hoops, but I live in a boring, square state! The vocab hoops are so fun too! I'm following the Goose + Trisser blog.